Purim with ArtScroll + Giveaway! Summer Reading Giveaway: Win $100! Want to win a $100 gift card to ArtScroll.com? Scroll down to find out how! The summer is here, and it’s a great time to catch up on your learning and reading. Whether you’re interested in new releases, ArtScroll classics, or books for your children, you’re guaranteed to find something for everyone in the family. To help you enjoy these great titles this summer, ArtScroll is giving away a $100 e-gift card to one of our blog readers! To enter the giveaway, simply leave a comment on this post telling us which ArtScroll books you’d like to purchase with $100! Giveaway ends on Wednesday, July 8th at 11:59 pm eastern time. **One winner will receive a $100 egift card via email. Winner will be chosen randomly and notified via email. Valid email address must be provided to claim prize. Winner will have 48 hours to answer or another winner will be chosen. Limit one entry per person. Giveaway: Choose Which New Release You Want To Win! Have your eye on one of ArtScroll’s new releases? Here’s your chance to pick which one you’d like to win! 2) Heavenprints: New from Sara Yocheved Rigler, best-selling author of Holy Woman, Heavenprints features stories of finding Hashem in our lives, and living our lives with Hashem. 4) I Have an Amazing Story for You! Rabbi Nachman Seltzer is one of the most well known and popular story-tellers in today’s world, and in this new release, he shares some of his most amazing, astonishing and unbelievable – but completely true! – stories. 5) Wisdom for Living: The Gross Family Edition: The weekly Parashah shiurim of Rav Noach Weinberg zt”l, visionary founder of Aish Hatorah, were legendary. Now they’re available in book form, transcribed by his loyal students, Rabbis Nechemia and Yitzchak Coopersmith. Giveaway is over. Congratulations to our winner, Dena Rechnitz. To enter the giveaway, simply leave a comment on this post telling us which of these amazing new titles you’d like to win. Giveaway ends on Wednesday, June 17th at 11:59 pm eastern time. Don’t forget: ArtScroll’s June Sale continues: Click here to save 20% on all books! **Giveaway ends on Wednesday, June 17th at 11:59 pm eastern time. One winner will receive the new book of their choice. Prize can be shipped within the USA. Winner will be chosen randomly and notified via email. Valid email address must be provided to claim prize. Winner will have 48 hours to answer or another winner will be chosen. Limit one entry per person. All discounts off of list price. Sale ends 6/24/15. With just under two weeks left to ArtScroll’s Big Set Sale, we have another great set to giveaway to one of our loyal readers! Didn’t win our first giveaway? Don’t worry, we have another chance for you to win. Our second set giveaway is for Rabbi Berel Wein’s amazing history set: Jewish History: A Trilogy. Scroll down to the bottom of this post for your chance to win this set. World renowned historian and lecturer, Rabbi Berel Wein, paints a panoramic picture of our people from the Classical Era (350 BCE) through the Modern Era, from the end of the First Temple Era, through Cossack pogroms, from the rise of the Chassidic movement, to the rebirth of Torah in America. This Slipcased Gift Edition includes the compact (7″x9″) edition of three best-selling titles: Echoes of Glory, Herald of Destiny, and Triumph of Survival. Giveaway is over! Congrats to our winner, Joseph. Enter to win: Leave a comment on this post about which ArtScroll set is on your wishlist. Note: This is the second of a couple of Set-Sale giveaways, so keep visiting The Official ArtScroll Blog to make sure you don’t miss any of your chances to win! **Giveaway ends at 11:59 pm eastern time on Monday, May 11th. One winner will receive the complete set of Jewish History: A Trilogy. Prize can be shipped within the USA. Winner will be chosen randomly and notified via email. Valid email address must be provided to claim prize. Winner will have 48 hours to answer or another winner will be chosen. Limit one entry per person. New Haggadahs from ArtScroll and a Double Giveaway! Want to win a copy of one of ArtScroll’s excellent new haggadahs? Scroll down for a double giveaway! Pesach is just a few weeks away, and we have two brand-new haggadahs to enhance your seder and help you really understand the story or yetzias mitzrayim. This year, invite a master story-teller to your seder. Acclaimed teacher, best-selling author, and master story-teller Rabbi Yechiel Spero is back with a brand new haggadah, Touched by Our Story. In this masterful new volume, Rabbi Spero combines wide-ranging, stimulating commentary on the Haggadah and, of course, his trademark true stories. Enlightening, engaging and eye-opening, this is a Haggadah that will ensure a lively, meaningful and enjoyable seder for us, our guests, and — most important of all — our children, the next generation to tell the stories. Giveaway is over! Congrats to Leah Rina and Zorach M. Spira on winning! Two separate readers will each win a copy of one of these new Haggadahs! To enter, leave a comment on this post telling us that you would like to win. **Giveaway ends on Wednesday, March 25th at 11:59 pm eastern time. One winner will receive a copy of Haggadah Touched by Our Story, and another winner will receive a copy of The Generation to Generation Haggadah. Prize can be shipped within the USA. Winner will be chosen randomly and notified via email. Valid email address must be provided to claim prize. Winner will have 48 hours to answer or another winner will be chosen. Limit one entry per person. We’re gearing up for Purim here at ArtScroll, and we’re giving away a selection of Purim titles and gifts for everyone in your family! ArtScroll’s extensive selection of Purim titles includes megillos for both adults and children, Purim reading and stories, halachic guides, and even Purim themed judaica and mishloach manos items. Make sure to shop now in order to get everything in time for Purim, then scroll down for your chance to win our ultimate Purim gift basket! The Ultimate Purim Gift Basket Giveaway! Esther: The Megillah: This is the sefer that launched what was to become ArtScroll. This ground-breaking sefer contains the text of the megillah, English translation, and commentary from 2000 years of talmudic and rabbinic sources. Let My Nation Live: Learn and understand the Purim story as never before with this fascinating book. While it reads like a story, this book is filled with carefully researched facts based on Talmudic and Medrashic sources. Download a sample chapter here. The Family Megillah: x2!! This easy-to-follow edition of Megillas Esther provides the text, translation and short commentary – all in a compact sefer. All of the adults in your family will want to use one of these, so it’s a good thing the winner will be getting two of them! Halachic Handbook: The Laws of Purim: This pocket-sized sefer contains a clear and concise summary of the laws of Purim in an easy-to-follow, readable format. The ArtScroll Children’s Megillah: In this edition of Megillas Esther, made especially for children, renowned children’s author, Shmuel Blitz, presents the story of Esther – and its lessons – in a thrilling and exciting manner. This is a great way for your children to learn the Purim story! Purim Cookie Cutters: ArtScroll carries a full line of Judaica for all seasons and Purim is no exception. 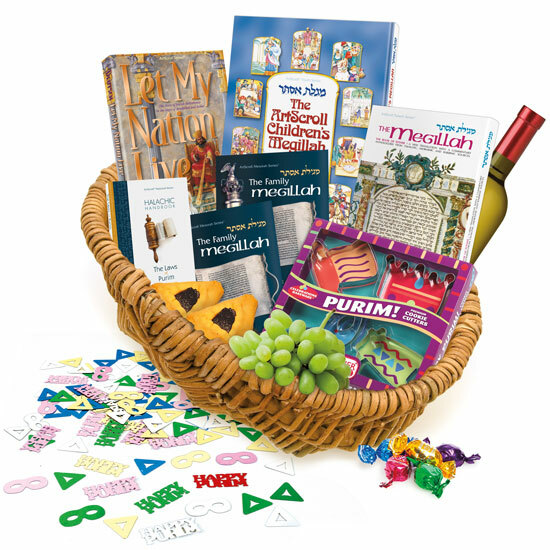 With fun paper-goods, mishloach manos gift boxes and lots more, ArtScroll.com is your one-stop-shop for all things Purim! These Purim shaped cookie cutters will make it easy to create adorable Purim-themed cookies! Purim Confetti: This confetti comes in an assortment of Purim shapes and will make your Purim celebrations a whole lot more fun! To enter the giveaway for all of the above items in ArtScroll’s Ultimate Purim Package: Leave a comment on this post letting us know that you would like to win! Giveaway now closed! Check back soon for the winner! **Giveaway ends on Wednesday, February 25th at 11:59 pm eastern time. Winner will receive one copy of Esther: The Megillah, one copy of Halachic Handbook: The Laws of Purim, one copy of The ArtScroll Children’s Megillah, one copy of Let My Nation Live, two copies of The Family Megillah, one set of Purim Cookie Cutters and one package of Purim Confetti. Prize does not include food and baskets. Prize can be shipped within the USA. Winner will be chosen randomly and notified via email. Valid email address must be provided to claim prize. Limit one entry per person. Bestselling beloved author Rabbi Abraham J. Twerski, M.D. shows us how to unleash and harness the vast power of berachos. In his inimitable combination of Torah insight and marvelous stories, he examines the structure of the berachos and the meaning of the words. He then leads us through our day, sharing insights and stories about the berachos that we recite, from the first blessing we say as we wash our hands, through blessings on Torah, on food, in prayer, all the way up to our last minutes before we go to sleep. And he takes us throughout the year, examining the special berachos of the Festivals and holy days, as well as the blessings we recite on all the special occasions of our lives. As part of our weekly free-download series, The Official ArtScroll Blog is offering a sample chapter of this excellent new book. ArtScroll offers a free download every Thursday – either from new releases, related to the parashah, or about timely topics. Click here for past downloads, and make sure to visit this blog every week for the newest. If you liked this post, make sure to spread the words – your friends will enjoy it too!